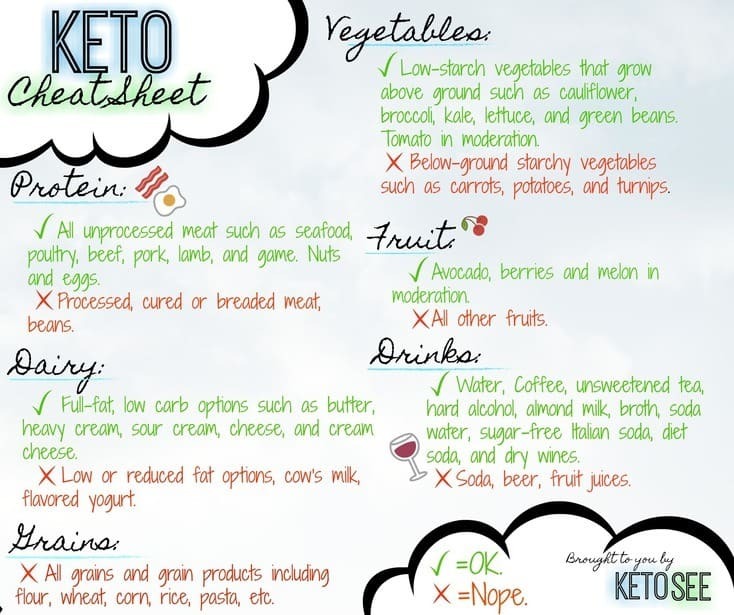 Keto is a very low-carb diet designed to put the body into ketosis, a state where fat is being broken down to provide ketones as energy for the body. The ketogenic diet originated in the 1920s as a treatment for epilepsy (elevated blood ketone levels can reduce the occurrence of seizures), but in recent years has become well-known for it’s effectiveness for weight loss. What are the Keto Diet guidelines? The original ketogenic diet limited carbohydrates to 4 percent of your caloric intake, with an additional 6 percent being from protein, and the remaining 90 percent being from fat. The evolved version aimed at weight loss rather than seizure prevention changes these macros slightly, being 5 to 10 percent carbs, 20 to 30 percent protein, and 65 to 70 percent fat. For example, on a 1,200-calorie diet, 60 to 120 calories should come from carbs, 240 to 360 from protein, and 780 to 900 from fats. Many simplified versions of the Keto diet simply recommend limiting carb intake to 20 net grams per day. This makes sense when you consider than one gram of carbohydrates contains roughly 4 calories. Meaning on a 1,600-calorie diet, 20 net carbs is the same as 80 calories or 5 percent of your intake. For reference, protein also contains 4 calories per gram, and fat contain 9 calories per gram. That’s it. The rules of a true keto diet involve only maintaining a low carb, moderate protein, high fat diet. Aren’t there forbidden foods on Keto? No. It’s a misconception that certain food types, such as grains, are forbidden on the keto diet. The original keto diet guidelines did not provide food lists. So, why do so many keto diet guides state things like grains and legumes aren’t allowed? Typically, foods that are considered “high carb” simply can’t realistically be consumed while maintaining proper carb-levels and sufficient calorie intake. For instance, a single slice of whole grain bread contains around 16 net carbs and half cup of black beans contains around 13 net carbs. As you can imagine, if you use up over half of your carb allowance with one serving, it will become nigh on impossible to consume enough food to meet your caloric needs without taking in too many carbs. Below is a cheat sheet with rough guidelines. Remember though, the “nope” foods are just foods that are higher in carbs that you’ll probably have to avoid. They aren’t banned, and there are exceptions to some rules (for instance, there are some ground vegetables that are lower carb, and some above ground veggies that are slightly higher). The important thing is to look at the net-carb content of the foods you want to eat. If it fits in your daily carb count without leaving you starving for the rest of the day, go for it. Do you have to eat crazy amounts of fat? Another misconception attributed to many keto diet plans is that you have to work extra hard to add fat to your diet. Dieters who opt to do things such as eat sticks of butter fall into this category. The keto diet replaces carb-rich foods with high-fat foods to meet caloric needs. This is most effective when done in a healthy way and doesn’t typically require adding fat where fat would not normally be.